Sign up for our Teacher Times e-newsletter. 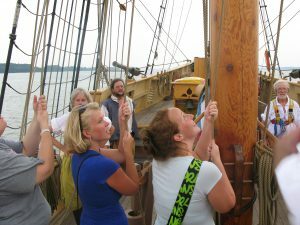 Teachers hoisting a sail at Jamestown Settlement. Join a select group of teachers committed to excellence in education! Experience the story of colonial America firsthand at Jamestown Settlement as you explore daily life activities, like fire-starting and house building, to gain a deeper understanding of life in early Virginia and its peoples. Recognize real world problems experienced by the three cultures converging at Jamestown and apply your new insights to design project-based learning for your classroom. 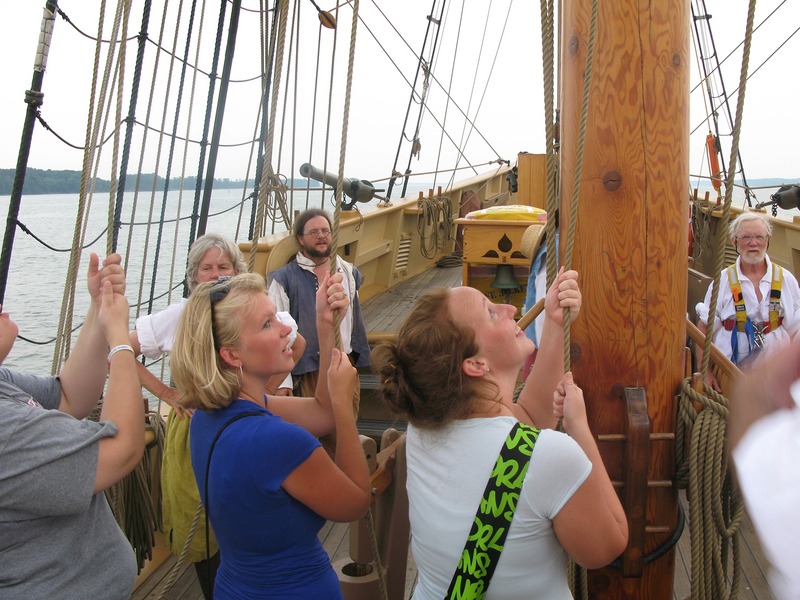 Become immersed in the history of 17th-century Jamestown through authentic learning experiences conducted by the living-history museum education staff. Collaborate with teaching peers to develop meaningful learning projects related to the history of Jamestown. Take home a resource kit, including reproduction artifacts, to supplement your Jamestown lessons. This Summer Teacher Institute is funded by private donors and is offered at no cost to Virginia Teachers. Submit your application and recommendation by March 17, 2019. Applicants will be notified of their status by April 15, 2019. Hotel, meals, stipend and materials are provided. Area of Specialty (ex. Social Studies, Science, etc. A) Describe the ways you would like to improve your teaching skills and historical knowledge by attending this institute? B) Give examples of how you have worked collaboratively or creatively to develop educational experiences for students.